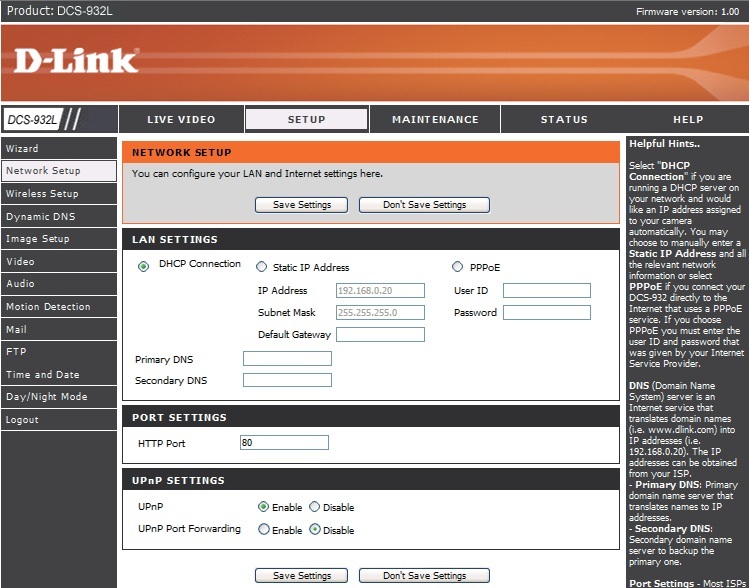 (DLink Video)How to upgrade the firmware on D-Link router such as DIR-655 Wireless Router? How to remove the graphical authentication from D-Link router DIR-655 login page? D-Link’s DCS-932L is a versatile and cost effective Network Camera offering both video and audio monitoring. It can also serve as a powerful surveillance system in security applications. The DCS-932L can be used with any wired or 802.11n/g wireless router. This section explains how to view the camera from either the Internet or from inside your internal network. 1. Assign a local IP address to your network camera. 2. 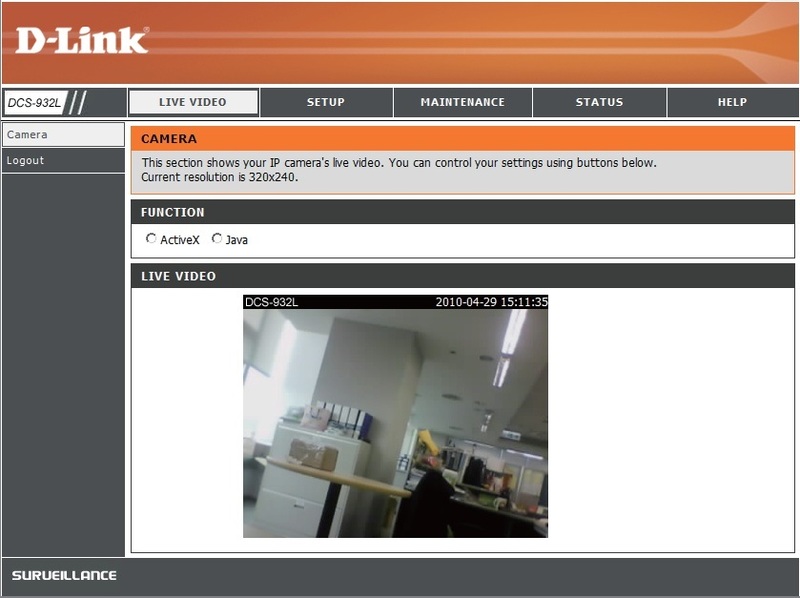 View the network camera using your Internet Explorer web browser. 3. Access the router with your web browser. 4. Open virtual server ports to enable remote image viewing. Note: These are manual steps; however, if you decide to use the wizard, it will perform every step automatically. This section is designed to walk you through the setup process for installing your camera behind a router and enable remote video viewing. For the basic setup of the DCS-932L, follow the steps outlined in the Quick Installation Guide. After you have completed the setup of the DCS-932L outlined in the Quick Installation Guide you will have an operating camera that has an assigned IP Address. Because you are using a router to share the Internet with one or more PCs, the IP Address assigned to the Network Camera will be a local IP Address. This allows viewing within your Local Area Network (LAN) until the router is configured to allow remote viewing of the camera over the Internet. 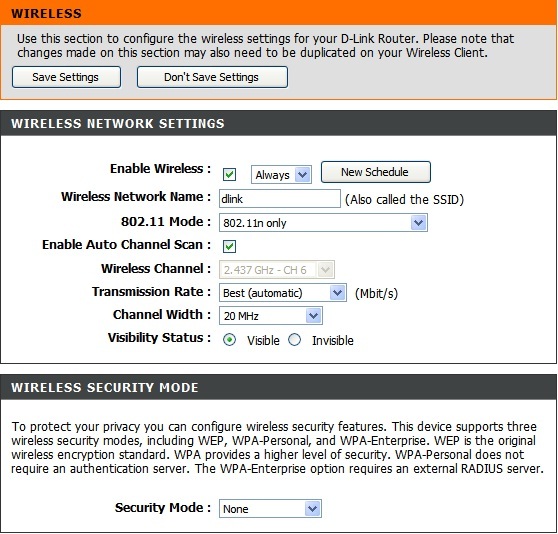 Run the setup wizard from the CD included with the D-Link DCS-932L. Follow the steps in the Quick Installation Guide to configure the DCS-932L. The camera will be assigned a local IP Address that allows it to be recognized by the router. Write down this IP Address for future reference. Run your Internet Explorer Web browser. In the address bar, type in the IP Address that was assigned to the Network Camera by the DCC program.The DCS-932L Live Video Page appears with a window displaying live video from the camera. You are able to view this screen from any PC running Internet Explorer on your LAN. Click on the Setup button on the left side of the display. Scroll to the bottom of the Network Setup page to display the ports used by HTTP and Streaming audio and video. The Setup > Network Setup page displays the port settings for your camera. If necessary, these ports can be changed if they are already in use by other devices (e.g. in a multiple camera environment). Note: The HTTP port is required to be opened for the D-Link DCS-932L. 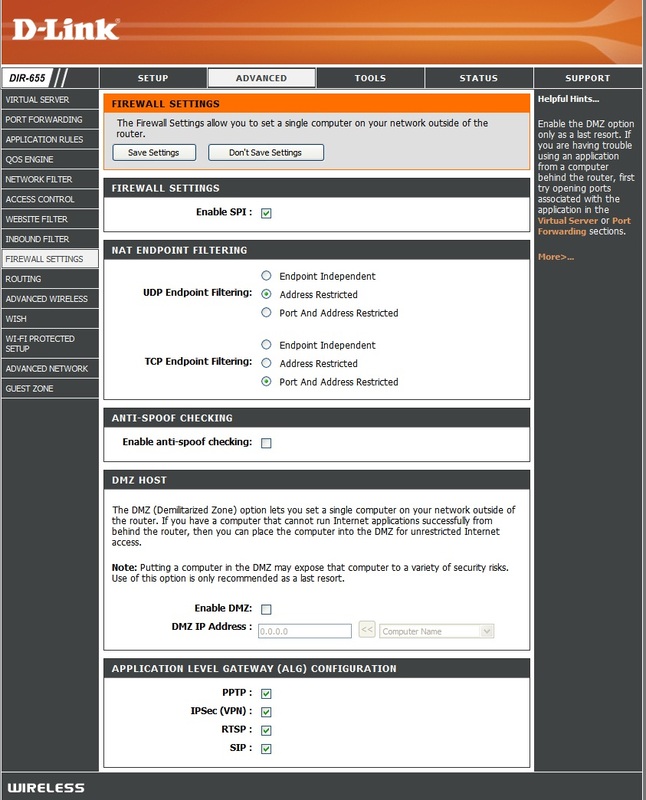 The following steps generally apply to any router that you have on your network. The D-Link DIR-655 is used as an example to clarify the configuration process. Configure the initial settings of the DIR-655 by following the steps outlined in the DIR-655 Quick Installation Guide. If you have cable or DSL Internet service, you will most likely have a dynamically assigned WAN IP Address. ‘Dynamic’ means that your router’s WAN IP address can change from time to time depending on your ISP. A dynamic WAN IP Address identifies your router on the public network and allows it to access the Internet. To find out what your router’s WAN IP Address is, go to the Status menu on your router and locate the WAN information for your router (as shown on the next page). The WAN IP Address will be listed. This will be the address that you will need to type in your Web browser to view your camera over the Internet. 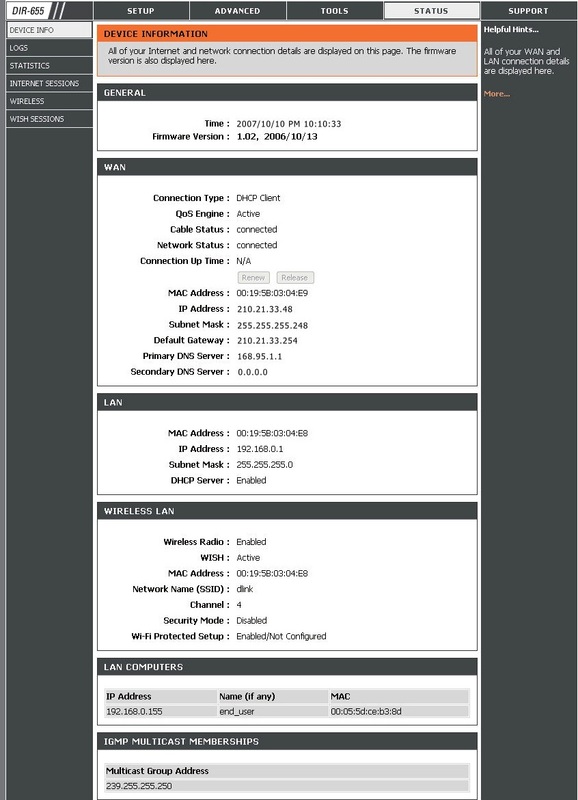 Your WAN IP Address will be listed on the router’s Status > Device Info page. Note: Because a dynamic WAN IP can change from time to time depending on your ISP, you may want to obtain a Static IP address from your ISP. A Static IP address is a fixed IP address that will not change over time and will be more convenient for you to use to access your camera from a remote location. The Static IP Address will also allow you to access your camera attached to your router over the Internet. The firewall security features built into the DIR-655 router prevent users from accessing the video from the D-Link DCS-932L over the Internet. The router connects to the Internet over a series of numbered ports. The ports normally used by the DCS-932L are blocked from access over the Internet. Therefore, these ports need to be made accessible over the Internet. This is accomplished using the Virtual Server function on the DIR-655 router.The Virtual Server ports used by the camera must be opened through the router for remote access to your camera. Virtual Server is accessed by clicking on the Advanced tab of the router screen. 2. Enter a different name for each entry. 3. Enter your camera’s local IP Address (e.g., 192.168.0.120) in the Private IP field. 4. Select TCP for HTTP port, and TCP for 5556 – 5559 ports. 5. If you are using the default camera port settings, enter 80 into the Public and Private Port section, click Apply. 6. Scheduling should be set to Always so that the camera images can be accessed at any time. A firewall protects your network from the outside world. The D-Link DIR-655 offers a firewall type functionality. The SPI feature helps prevent cyber attacks. Sometimes you may want a computer exposed to the outside world for certain types of applications. If you choose to expose a computer, you cam enable DMZ. DMZ is short for Demilitarized Zone. This option will expose the chosen computer completely to the outside world. SPI (Stateful Packet Inspection, also known as dynamic packet filtering) helps to prevent cyber attacks by tracking more state per session. It validates that the traffic passing through the session conforms to the protocol. Endpoint Independent – Any incoming traffic sent to an open port will be forwarded to the application that opened the port. The port will close if idle for 5 minutes. Address Restricted – Incoming traffic must match the IP address of the outgoing connection. Address + Port Restriction – Incoming traffic must match the IP address and port of the outgoing connection. If an application has trouble working from behind the D-Link router, you can expose one computer to the Internet and run the application on that computer. Note: Placing a computer in the DMZ may expose that computer to a variety of security risks. Use of this option is only recommended as a last resort. Specify the IP address of the computer on the LAN that you want to have unrestricted Internet communication. If this computer obtains it’s IP address automatically using DHCP, be sure to make a static reservation on the Basic > DHCP page so that the IP address of the DMZ machine does not change.